There are a lot of K-series automatic models, 59 to be exact. There are even more Accumatic and Thin-o-matic models, well over 80 of each when you consider the calendar models too. I've done 39 of the 59 K-series models and I've got my 40th ready to add to the list. It's a 1957 Automatic K-453. This model was produced for three years. 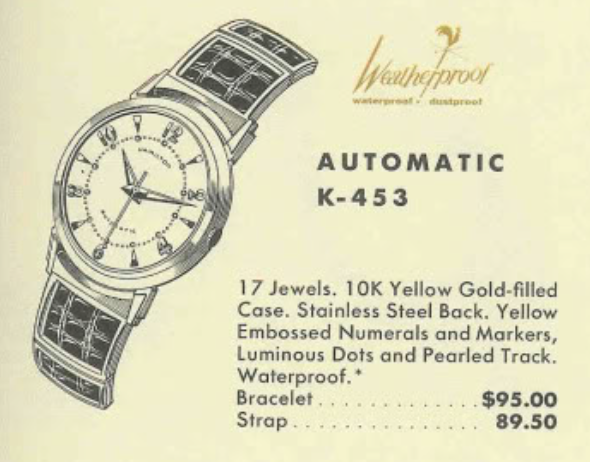 The K-453 came with a 10K gold filled bezel and a stainless steel back. The dial has embossed numerals and markers and there's a pearled gold track inside the hour markers. There are luminous dots at each hour and the hands are open dauphine-style with lume inside. Like most K-series models, you will find the 17 jewel 661 movement inside. I suppose it's safe to say that I've found most of the commonly found Automatics. I've gotten to the point where beggars can't be choosers and I go after especially rough models just so I can add them to the list of models I've located. That's what happened with my K-453 project watch. It was rough and I thought the worst case would be I'd have a spare parts movement. It wasn't running, the dial was burned by the radium on the hands and it just didn't look promising. I like this style of screw off stainless steel back. There's a lot of meat for the case wrench to grab ahold of. I couldn't get this watch open until I soaked it with penetrating oil. The old gasket inside enclosed the case back like glue. At least the movement is in good shape. I can wind and wind and wind it without resistance, so I suspect the mainspring is broken. The inside of the case back is properly marked, even if it doesn't say what model it is. Just knowing the case is gold filled with a stainless back would indicate it's a 450-something. If it was solid 10K gold with a stainless back it would be a 350-something. Solid 14K with a stainless back is a 250-something. Without the beat-up old crystal in the way, the dial looks like it might be salvageable. There's not much I can do about the radium burn but I can clean of the radium from the hands and dial in the ultrasonic. That will at least end the damage. Sure enough, the mainspring is broken. Sometimes I get lucky and find the arbor just came disconnected from the spring. However, you can see the arbor is still connected and the first coil broke. Automatic mainsprings are designed to slip in the barrel and the last coil has a spline to push the end against the barrel. Fortunately I have a replacement mainspring. Installing these is similar to a regular mainspring but getting the spline into the barrel can be a pain. Success! A little mainspring grease is added and I can reinstall the arbor in the center. A new crystal is definitely called for. A 28.3mm diameter GS PHD will do the trick. Everything is cleaned and dried... everything except the cannon pinion and the hour wheel, that is. They seem to have disappeared. I found the hour wheel after a little searching and the cannon pinion is missing in action. Fortunately I have a spare. The reassembled movement is running nicely so it's off to the timer. It's running a little fast but a slight tweak to the regulator will fix that. I'll leave it here for now. I have to admit that I pulled a rabbit out of the hat with this watch. It actually turned out really well. The dial still shows a slight burn but it has a nice even brownish tone that goes nicely with a brown lizard strap. A little fresh lume goes a long way toward brightening up a dull dial and hands. This luminous paint needs to be charged by light but it will glow for a little while. It would have been interesting to see what radium paint was like back in the day. It glowed 24x7... kind of eerie when you think about it. Radium was at one time considered "a wonder material" and used in things like tooth paste, etc. Turns out it can also kill you. It's easy to get wigged out by radium but the dial, case and crystal block the radiation so you don't need to worry about it unless you eat the watch. You don't really want to handle it though - which is why I will typically remove it in the ultrasonic cleaner.